Rebecca Kiss/Assistant Photo Editor Junior designated hitter Pat Britt hit a two-run single to propel Binghamton to a win against UMass Lowell on Sunday. 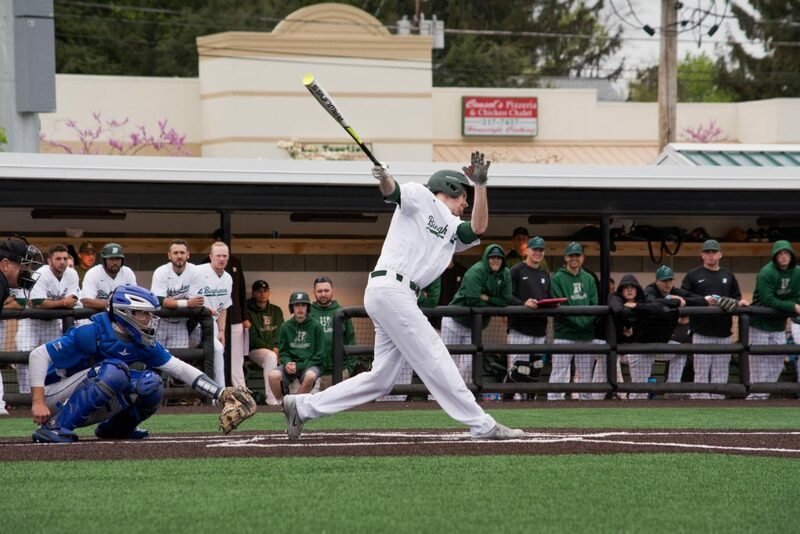 In the Binghamton baseball team’s three-game sweep over UMass Lowell this past weekend, freshman second baseman Justin Drpich played the hero once again. Just five days after hitting a walk-off grand slam against St. Bonaventure, Drpich hit a game-winning double that scored junior catcher Jason Agresti in the bottom of the eighth inning of the series finale on Sunday — securing a 5-2 victory. Drpich’s hit led to a three-run rally, which was continued with a single from junior designated hitter Pat Britt that scored two runners. Despite a strong outing, redshirt junior starting pitcher Jacob Wloczewski was credited with a no-decision. He struck out 10 and allowed just one earned run in six innings before being replaced by freshman pitcher Ben Anderson. Senior relief pitcher Nicholas Liegi notched the win after pitching 1 1/3 scoreless innings to close out the game. “All weekend long, I thought we threw the ball well and pitched the ball well,” Sinicki said. The Bearcats (26-9, 11-2 America East) and the River Hawks (22-22, 10-10 AE) played through two days of steady rain. The Bearcats defeated the River Hawks, 6-2, to open the series in the first game of a doubleheader on Saturday. Junior center fielder CJ Krowiak and Drpich hit two home runs each, driving in five of BU’s six runs. Binghamton jumped out to an early 5-0 lead before UMass Lowell scored two runs in the eighth inning. Sophomore starting pitcher Nick Gallagher struck out eight batters in six scoreless innings. Junior pitcher Joe Orlando allowed two runs in two innings of relief before junior pitcher Dylan Stock secured the victory in the ninth. With the win, Gallagher improved to 7-1 so far this season with a 1.40 ERA. In game two, senior first baseman Brendan Skidmore hit a walk-off single to center field in the bottom of the seventh and final inning. With the game tied at five, Skidmore drove in redshirt sophomore third baseman Justin Yurchak to secure a 6-5 win and a series victory over the River Hawks — his 26th RBI of the season. Yurchak had reached base on a walk before advancing to third base on a wild pitch and a sacrifice bunt by Agresti. With a one-run lead in the fourth inning, senior left fielder Darian Herncane hit a two-run homer deep to center field. But after that, Binghamton’s pitching staff allowed three runs in the sixth. Junior starting pitcher Nick Wegmann allowed four earned runs and three walks in 5 1/3 innings pitched before being replaced by freshman pitcher Jake Miller for the final two outs of the sixth. Stock was credited with the victory after striking out two batters in the seventh. Drpich’s clutch hitting on Sunday led the Bearcats to their sweep of the River Hawks. Binghamton is set to face Siena on Wednesday. First pitch is scheduled for 2 p.m. from the Bearcats Sports Complex in Vestal, New York.